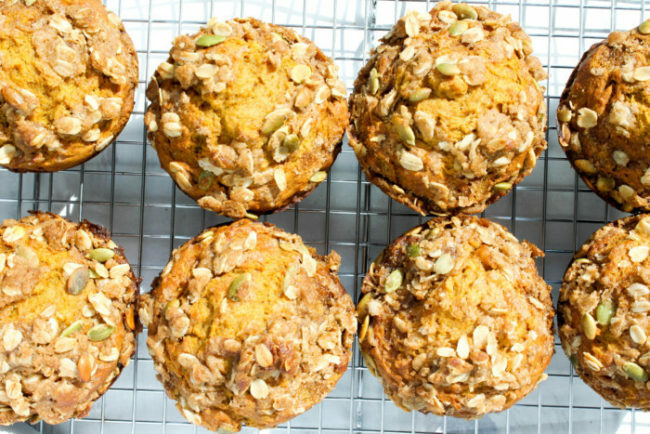 These Pumpkin Banana Muffins are everything you’ve been wishing for in your breakfast this fall. 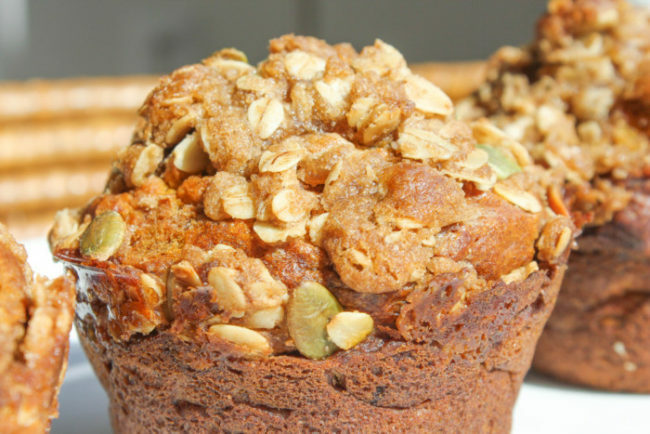 It’s part banana bread, part pumpkin bread, topped with a crunchy streusel topping and served in an easy single-serve grab and go muffin form. 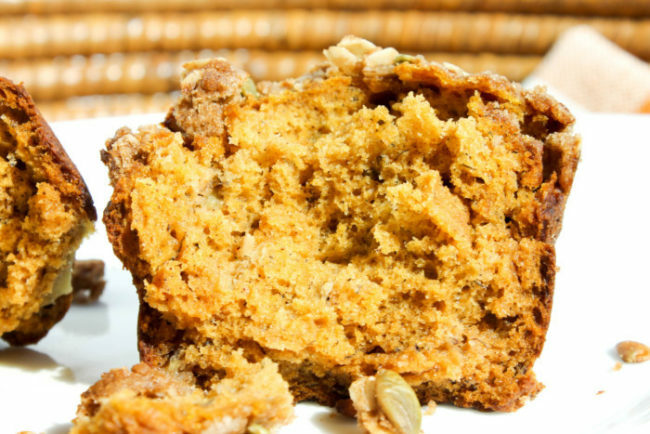 Your house will smell like angels when you have a batch of these in the oven … sweet sweet pumpkin spice angels. I love banana bread, don’t get me wrong – but I hate waiting an hour for it to bake, only to find that the top is crunchy and the inside is still not fully cooked. I don’t know what the magic touch is to get a perfectly even-cooked banana bread, but I’ve started to prefer just making banana bread in muffin form anyway. I like to think of it as automatic portion control – since we all know we’re guilty of slowly cutting away at a loaf of banana bread piece by piece until somehow it’s all gone. Admit it. You’ve done it too. 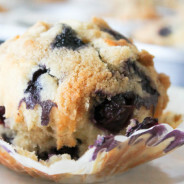 The best part about muffins is the top. Ironic, since muffin tops are usually associated with not being able to button your jeans. But the more streusel the better I say. 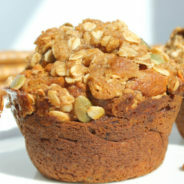 Every time I make a new muffin recipe, I experiment with different ingredients for the streusel topping. 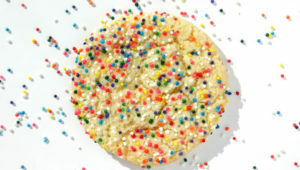 In this recipe I used old fashioned oats and pumpkin seeds for extra crunch. And by baking the muffins at a higher temp for the first 5 minutes before lowering it the rest of the time, you’ll get a super crunchy top while not overcooking the inside. The best muffins are those that have a super crunchy top but are still soft and moist on the inside. And these came out perfectly. 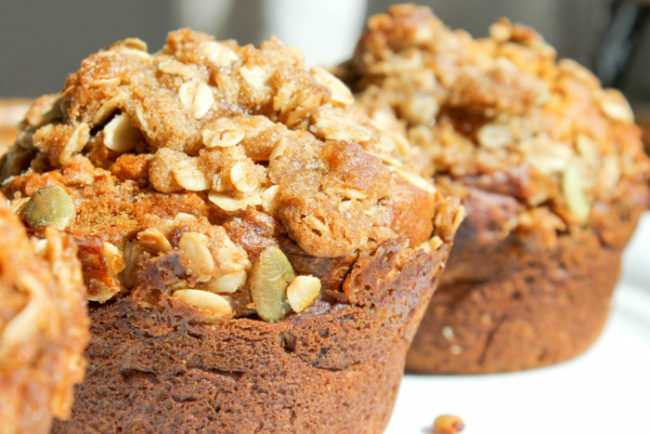 They definitely have the texture and flavor of banana bread, with a nice hint of pumpkin that’s not too overpowering. I use Vietnamese cinnamon in my fall recipes from King Arthur Flour, because it has a distinct strong cinnamon flavor that is absolutely delicious. You can usually find it at a Sur La Table store or online. 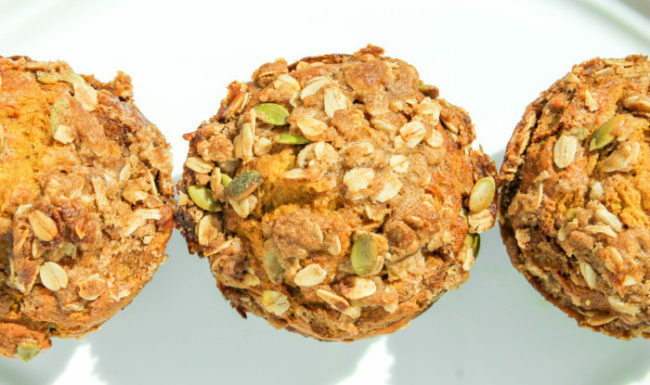 So the next time you find yourself faced with some overripe bananas during pumpkin season, don’t force yourself to choose between the two – whip up a batch of these Pumpkin Banana Muffins and satisfy all of your breakfast cravings. 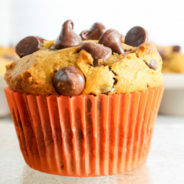 A combination of Pumpkin and Banana Bread recipes in an easy to serve muffin size. Preheat the oven to 425 degrees F. Spray 8 jumbo muffin tins with nonstick spray and set aside. In a medium bowl, sift together the flour, baking soda, salt, baking powder and pumpkin pie spice and set aside. In a large mixing bowl, cream together the butter and light brown sugar. Add in the eggs, mashed banana and vanilla extract and mix well. Scrape down the side of the bowl before adding in the dry ingredients. Slowly add the dry ingredients to the wet batter and mix with a wooden spoon. Use a large cookie scoop to fill the muffin tins about 3/4 of the way full. 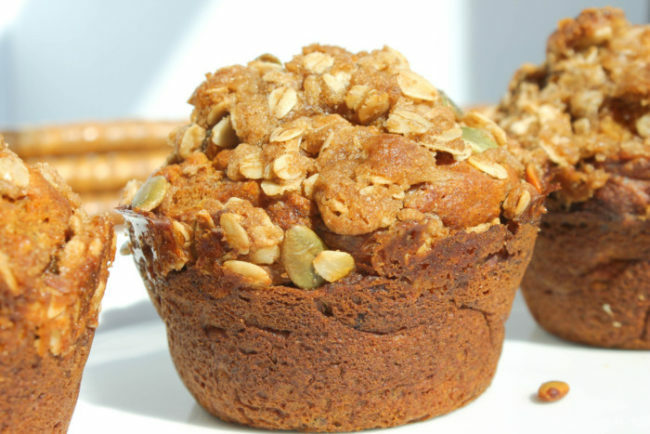 To make the streusel topping, combine the melted butter, flour, brown sugar, oats, cinnamon and raw pumpkin seeds in a small bowl using a fork. Evenly top the muffin batter with topping. 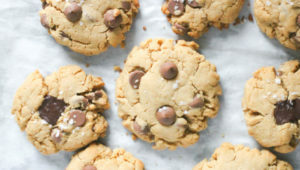 Bake at 425 degrees F for the first 5 minutes, then lower the temperature to 375 degrees F for the remaining 15-18 minutes, until the tops are golden and a toothpick comes out clean from the center. The initial high heat helps give the muffins a crunchy top, while not burning the rest of the muffin while it cooks through. Let the muffins sit for a few minutes before transferring to a plate or cooling rack. Enjoy!